Today marks the official opening of Thirsty Monk’s Denver outpost. I was fortunate enough to get a sneak preview of the space and the beers last Friday, and if that experience was any indication of the things to come, I have a feeling that the Monk is is going to be a new favorite in my brewery repertoire (a surprise since I’ve never really sought out Belgian beers). Born a decade ago in a stone-walled basement in Asheville, North Carolina, Thirsty Monk’s first location evolved to include a craft beer bar on the main floor and a speakeasy up top. 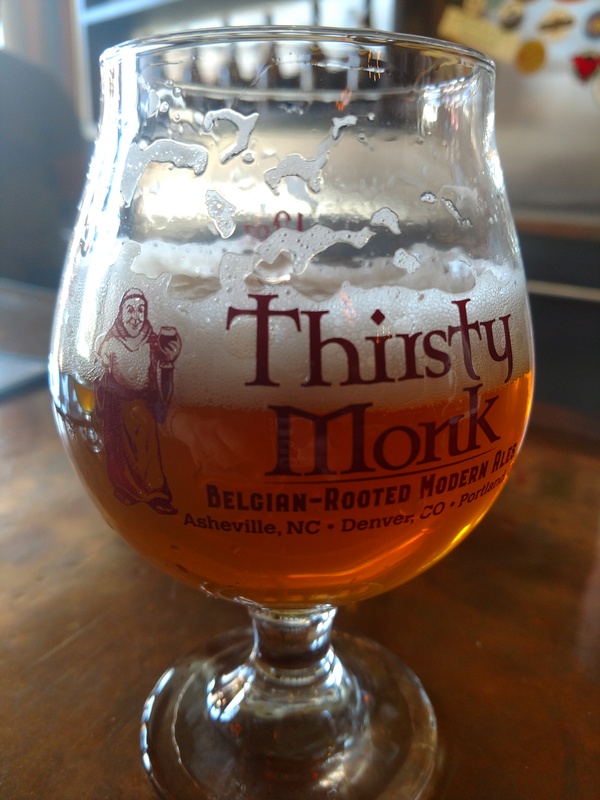 As of today, the Thirsty Monk business umbrella includes six entities (not all are breweries) in three states – North Carolina, Oregon, and Colorado. 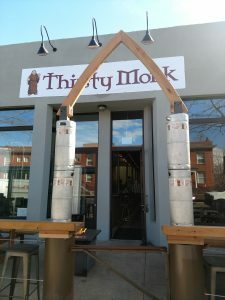 The Denver location will produce beer that’s shipped to Portland and Asheville (and vice versa where Asheville is concerned) and the Asheville brewery will now concentrate “on the specialty stuff,” says Thirsty Monk owner Barry Bialik. “Neighborhood” is at the core of Bialik’s vision – his business model is rooted in intimate, hyperlocal experiences that aren’t weighed down by the need to expand quickly, package or find more production space. Colorado also presented the right fit for the Monk’s business model – brewery/tap room, no distribution. Bialik’s partner in the Denver endeavor is head brewer Brian Grace. I’ve written about Grace before – having worked for Jolly Pumpkin, Crooked Stave and Moylan’s, he knows his way around a brewery, and he loves working with Belgian yeasts. Months ago, responding to a straightforward ad for “brewer wanted, Denver,” Grace soon found himself meeting with Bialik. “I liked Barry’s vision – keeping things small and local,” Grace said. “I thought ‘That’s exactly right. Keep it small.” Grace had already witnessed the growing pains that too often come with rapid expansion and he was wary of that business approach. He “really connected with Barry and his concept,” and soon he was happily on board, overseeing brewing operations for the Thirsty Monk entire. With 16 beers on tap for thirsty Denverites, there’s something for everyone at Thirsty Monk. I asked Grace about his favorites, and he quickly pointed to the Wiser Monk, a 4.5% Table Beer that starts with a dash of pepper and ends clean and crisp. It’s light and infinitely drinkable. Similar to his take on the business end of things (“keep it small”), Grace likes the challenge of low ABV beers, inspired by their subtlety and the desire to make them as approachable as possible. “Session ales are a lost art,” he remarked. “They’re harder to make and you have to try harder to make them good.” Grace has big plans for the Monk’s sour program, which will focus on open fermentation and wild ales that are “more brett-forward” (as opposed to mouth-puckering sours that leave your salivary glands begging for mercy). I tried several beers at the preview and all of them were fantastic. Not just good or great – each one was a cut above 90% of the beer I’ve had in Colorado. I started with a Cherry Gose, 4% ABV, a lovely ruby-hued beer that perfectly showcased the tart and earthy nature of the cherries. (As a general rule, I don’t drink fruit beers, save for cherry and the occasional stone fruit variants, but sometimes one comes along that impresses the hell out of me. This was one of those beers.) The addition of Mediterranean sea salt – “to replicate the saline profile of Liepzig water,” according to the Monk’s menu – provided the right catalyst to push the cherry flavor to its maximum expression. What a beautiful beer. Must Love Coconut IPA lives up to its name, with a subtle coconut flavor that complements the marriage of Citra, Amarillo and Centennial hops. I sometimes think coconut tastes chemical-y in beers, but this one didn’t slide into suntan lotion territory. Screaming Monk, the house IPA, was one of my favorites. Yes, the ubiquitous IPA, reviled by some and loved by many – the Monk version is loaded with hoppy goodness that marries well with the lovely fruity esters. This beer is bipartisan. It has the potential reach across the aisle and appeal to both IPA lovers and Belgian lovers alike, as well as those who love Belgians and hate IPAs and those who love IPAs and hate Belgians. This is hard as hell to do. Along with the Cherry Gose, I’ll be drinking this beer again and again. Crave Almond Joy? Then CocoNorm, a Porter infused with toasted organic coconut, is your dream come true. Roasty, chocolatey, not too sweet and ending dry (thanks, Bialik told me, to that beloved Belgian yeast), I was impressed by this beer and look forward to drinking one should a late spring snow hit (please!) and I find myself sitting at the Monk bar, watching the flakes fall. Farmhouse IPA is a wonderful twist on a traditional style. Bright and refreshing and a bit on the spicy side, this beer perfectly speaks to Monk’s brand statement “Belgian-rooted Modern Ales.” Old school meets new school and it works, very well. I may not be one of those lucky folks who has been able to visit every brewery in Colorado, but I’ve seen (and drank) enough to know when a place has the potential to make a serious and lasting impact. I’m also well-acquainted with the Uptown area because I live near there, and over the past two decades I’ve witnessed much of 17th Avenue develop into a row of successful businesses invested in the community and in each other. I’ve little doubt that the Monk will establish (Belgian) roots fast, growing into a place that feels like it was born and bred right here in Denver. Admittedly, I was a little skeptical about an out-of-state brewery staking a claim in one of the most competitive and cut-throat beer markets in the country, but that skepticism is now gone. After all, Thirsty Monk CAME from one of the most competitive beer markets in the country, so it’s just establishing a second (third?) home in a familiar, albeit Western, environment. Works for me. From the cozy atmosphere and spectacular beer to the great staff, superlative head brewer and kind and gracious owner, there’s not much to dislike about this addition to the local brewery scene. 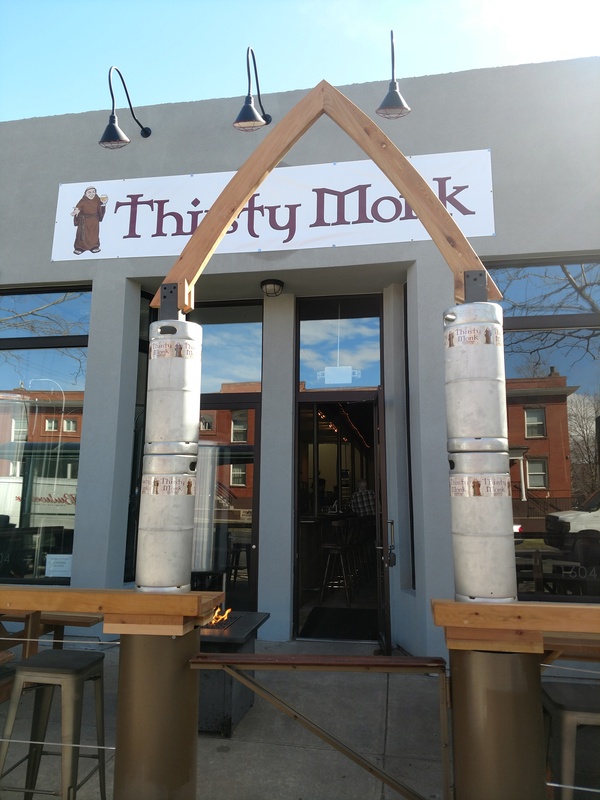 Mark my words: Thirsty Monk is here to stay, and the Denver beer community is all the richer for it.